DLL stands for Dynamic-Link Library and DLL files are core part of Windows Operating Systems. PC users often see DLLs in error messages reporting that something is wrong with DLLs. 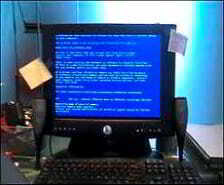 When such happens, any software depending on a particular dll will fail to start or give errors, if the dll is missing or corrupt. As an expert computer technician, I have built this website to help people solve their DLL related computer problems. As of today, Dll4Free.com provides 35169 dll files available for free download. Why are you getting DLL error messages? An application was uninstalled and deleted a .dll file required by another software. A software was installed and overwrote the .dll file with an old version or a version that is not compatible with other applications. Unsuccessful installation of a software damaged some files which results in dll errors. Either you or a malicious program (spyware, adware, virus) deleted the .dll file. Missing or damaged dll files are likely to cause errors. Dll4free provides the right platform for you to search and download. First search our database for the required dll file and you can find all instructions to fix the error permanently.